Nearly four months after the landmark UNCLOS arbitration ruling in the case brought by the Philippines against China, President Rodrigo Duterte’s about-face in his approach to the Philippines’ bilateral disputes with China has dominated regional discussion. While this attention is entirely warranted, it has also meant undue neglect of other dimensions of the ruling and its regional effects. All the South China Sea disputes, including the bilateral one between the Philippines and China at the Scarborough Shoal, are importantly about regional fishing rights. President Duterte’s focus on regaining access to the traditional fishing grounds at Scarborough Shoal has highlighted that fact. Not only are clashes between fishing vessels and national coast guards the most common type of encounter between rival claimants to the Spratly Islands, but most of the questions that the Philippines originally brought to the tribunal related to fishing. A full two-thirds of the arbitral points submitted were requests to clarify national fishing jurisdictions or adjudicate Chinese enforcement practices in those jurisdictions. The resulting award is naturally dominated by discussion of fishing issues and provides much-needed clarity. Of the fifteen points that make up the arbitral award, five establish final exclusive economic zone (EEZ) or territorial sea boundaries, though they often do not establish whose boundaries; three confirm that China violates the United Nations Convention on the Law of the Sea (UNCLOS) by interfering with the Philippines’ use of its own EEZ and traditional fishing grounds; two confirm that China has damaged the Philippine-owned marine environment; and one confirms that China has breached UNCLOS and the International Regulations for Preventing Collisions at Sea (COLREGS) through unsafe operation of its law-enforcement vessels. So while it is well-established that the South China Sea disputes are about more than fish, much of the arbitral ruling is decidedly focused on this single issue. In that context, there is a clear opportunity to explore regional means to reinforce the ruling through fisheries enforcement activity. Doing so both strengthens the rule of law in Southeast Asian seas in line with the arbitral award and promises some measure of progress on the too-often-ignored regional fisheries agenda. 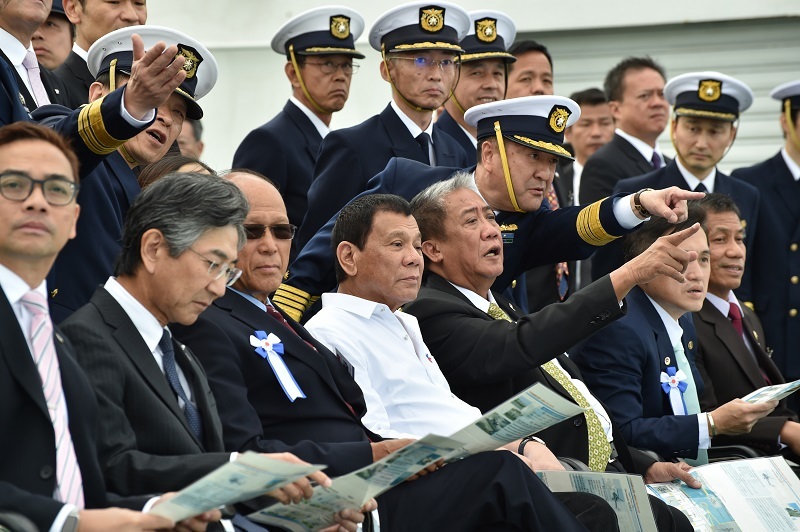 Philippine President Rodrigo Duterte (fourth from left) and other officials inspect drills conducted by the Japan Coast Guard in Yokohama on October 27, 2016. KAZUHIRO NOGI/AFP/Getty Images. Fisheries management and enforcement spans two political levels. First, at the domestic level, it formulates and implements policy inside the established EEZ or territorial sea boundary of a given state. In the South China Sea dispute, the Philippines requested (and received) confirmation from the tribunal that China had violated the Philippines’ rights by illegally operating within that boundary. The second, and less-noticed, level is the regional one—that is, formulating and implementing regionally agreed-upon standards outside the established EEZ or territorial sea boundaries of littoral states. After all, fish are the only sovereign resources that stubbornly move between and among jurisdictions. To ensure that migrating species are not fished down to zero in regional high seas (so that there will be some fish left to swim into EEZs), UNCLOS encourages signatories to develop management measures in areas beyond an EEZ’s jurisdiction. In the South China Sea, the arbitral ruling establishes the final EEZ and territorial sea boundary lines in the Spratly Islands. It can be reinforced by appropriate activity undertaken both inside those lines (i.e., in areas of a confirmed Philippine EEZ) or outside those lines in areas that we now know are part of the high seas. Much discussion has explored response options in the former category; almost none has considered the latter. The Western and Central Pacific Fisheries Commission (WCPFC) is a regional mechanism worth exploring in this light. The WCPFC is a regional fisheries management organization (RFMO) established in 2004 pursuant to the 1996 Fish Stocks Agreement. Its mission is to manage the dwindling and highly migratory fish stocks of the Pacific. The commission’s members are littoral states of the convention area, which stretches roughly from Hawaii to Vietnam, from Alaska to New Zealand, and nominally includes the South China Sea. This hodgepodge of members all have a single common interest, one they can only pursue in concert: prevent their migratory asset from being depleted on the high seas. To be clear, the WCPFC does not assert sovereign rights over the high seas but instead exercises limited jurisdiction over the fish themselves. To ensure the sustainability of their shared sovereign asset, the commission’s members use sound science to set regional quotas and parameters for acceptable fishing methods on the high seas and “name and shame” vessels known to be regularly engaged in illegal, unregulated, and unreported fishing in the convention area. The WCPFC’s rule-making in regional high seas is not only allowed by UNCLOS and the Fish Stocks Agreement but indeed encouraged by those treaties. (See Articles 117–19 of UNCLOS and Article 21 of the Fish Stocks Agreement.) The drafters of both recognized that there was no point in awarding coastal states exclusive rights over the fish in their coastal zones if those same fish could be hunted to extinction in the adjacent high seas. They also recognized that management of fish stocks is best accomplished at the regional, rather than the global or national, level. Given that no country has yet figured out how to contain fish within its EEZ boundary, the WCPFC and RFMOs like it are the most practicable way to accomplish that task. 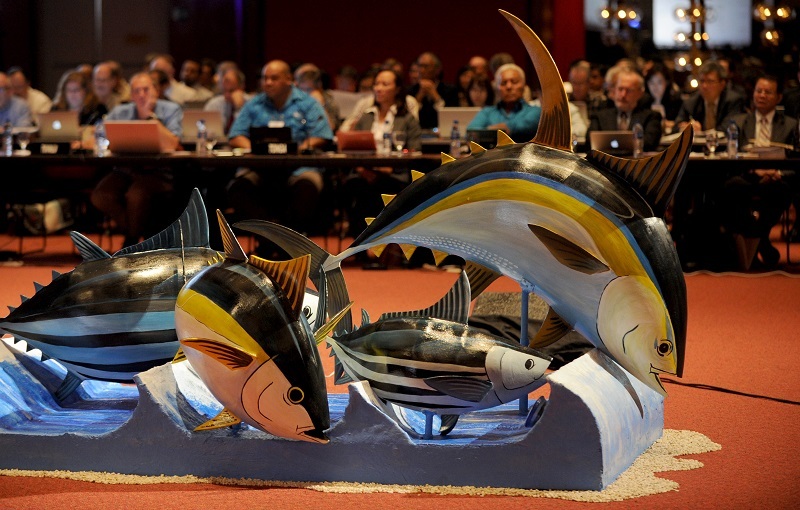 Sculptured tunas sit as the centrepiece of the ninth regular session of the Western and Central Pacific Fisheries Commission (WCPFC) in Manila on December 2, 2012. JAY DIRECTO/AFP/Getty Images. As an organization, the WCPFC is not unique. There are other RFMOs that do similar work. But the WCPFC is the only RFMO that supports conservation measures with a year-round enforcement framework. To ensure that its regulations have more than just paper value, the WCPFC institutes a high-seas boarding and inspection regime. Monitoring and inspection operations assist members with enforcing regional and national fishing regulations in the convention area and among vessels flying their flags. Underpinned by the operations of the commission’s most capable members, hundreds of such boardings have been conducted in the Pacific’s high seas since 2008. The vast majority of these were undertaken by the French Navy based out of French Polynesia and the U.S. Coast Guard or U.S. Navy during regular patrols and transits between the hundreds of thousands of square nautical miles of U.S. EEZ that lie between Hawaii and Guam. The data publicized by the WCPFC is “highly protective of member states” and therefore hard to assess. But by all available accounts its operations have resulted in prosecutions of those fishing illegally (though arguably not enough) and have started to shine a light on a growing blacklist of vessels known to engage repeatedly in illegal, unregulated, and unreported activity. In a black market business thought to be worth billions, this kind of international cooperation is sorely needed. To be clear, vessels in the high seas remain under the sole jurisdiction of the flag state and enjoy the freedom to navigate anywhere they please. But the WCPFC convention does place legally enforceable limits on how much fish they can catch while they sail, and by what means. Jurisdiction is enjoyed cooperatively: all WCPFC members are eligible to participate in patrols and boardings on the commission’s behalf. Patrolling members do not arrest fishermen or seize ships, but they do detain vessels that are believed to be engaged in illegal practices. Under a WCPFC flag, inspectors board and search vessels suspected of fishing illegally in the convention area, detaining them for up to four hours at a time. Inspectors then file a report both with the flag state (noting violations that the flag state is responsible for prosecuting) and with the WCPFC itself. The WCPFC regime is not a perfect solution to regional illegal, unregulated, and unreported activity, but it is the most effective instrument of its kind and probably the best that international law will allow. A boarding regime that detains and inspects vessels, but does not arrest fishermen, is an elegant compromise intended to put some much-needed muscle behind the conservation of international fisheries without violating the principles of flag state jurisdiction or freedom of navigation. As proof of the program’s success, WCPFC high-seas boardings and inspections have been conducted thus far without controversy in the open waters of the Pacific. The most important fishing states in the world (including China, Vietnam, and the Philippines) count themselves as contracting parties or cooperating nonmembers of the regime and acquiesce to its operations. Taiwan even conducts WCPFC boardings itself, though only a small number so far. 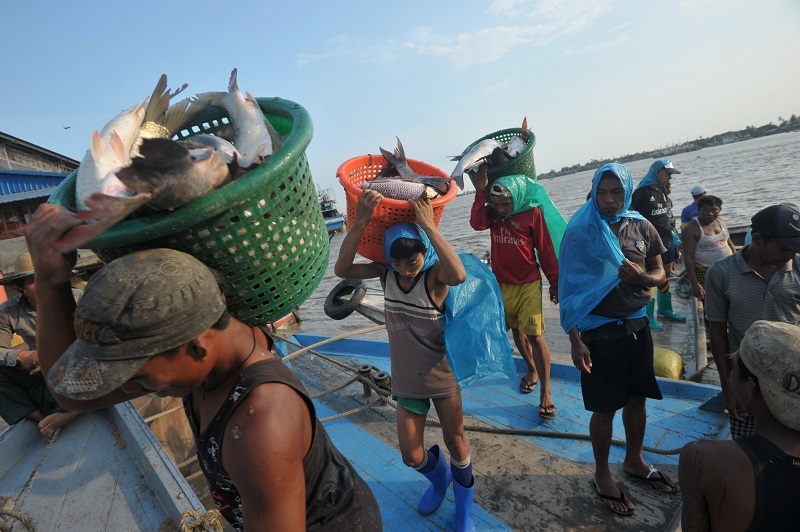 Workers carry fish baskets as they unload a catch from a boat at a jetty near a fish market in Yangon on April 23, 2015. Soe Than WIN/AFP/Getty Images. Until now, the WCPFC has formally included the South China Sea in its convention area but avoided operating there in practice. With all the jurisdictional ambiguity and diplomatic tension in the South China Sea, this has been the most sensible approach. But following the arbitral ruling, much jurisdictional ambiguity has been resolved. While rival claimants to the Spratly and Paracel Islands still have much left to resolve in terms of establishing sovereignty over features and associated territorial seas, the arbitration panel confirmed that there are simply no EEZs to dispute in the Spratly Islands. Whether or not final sovereignty of land features has been settled, WCPFC jurisdiction over waters lying beyond 12 nautical miles of any disputed feature has been clearly established, at least as a legal principle. The time may have come for policymakers to take a second look at how to leverage this regional success story to bring some order to an increasingly lawless sea. Consider recent developments: Chinese-flagged fishing vessels continue to flood the area inside the nine-dashed line by the hundreds, including areas that the arbitrators confirmed form part of the EEZs of other countries. Chinese authorities promise to prosecute “trespassers” that fish without a Chinese-issued permit in waters that the arbitrators have confirmed are regional high seas and do not belong to China or any other country. The WCPFC’s two most capable members, France and the United States, have stated their intent to uphold the rule of law in the South China Sea, but they seem unable to find the place to appropriately operationalize it. The United States already conducts effective, uncontroversial, and partnered fisheries enforcement operations throughout the Pacific, from both U.S. Coast Guard and Navy platforms. As for the Association of Southeast Asian Nations (ASEAN), three of its members littoral to the South China Sea already participate in WCPFC activity. Indonesia and the Philippines participate as full members, while Vietnam is a cooperating nonmember. Moreover, ASEAN’s primary fisheries body, the Southeast Asian Fisheries Development Center, recognizes the need to cooperate in the development of strengthened monitoring, surveillance, and control (MSC) programs to back up decades of ASEAN collaboration on research and policy for regional fisheries conservation. The MSC program that is run out of the WCPFC might provide ASEAN with an opportunity to either partner with extraregional players or undertake independent action on fisheries enforcement on regional high seas, or some blend of the two models. If ever the stars were aligned for enhanced fisheries management in the South China Sea, it is now. 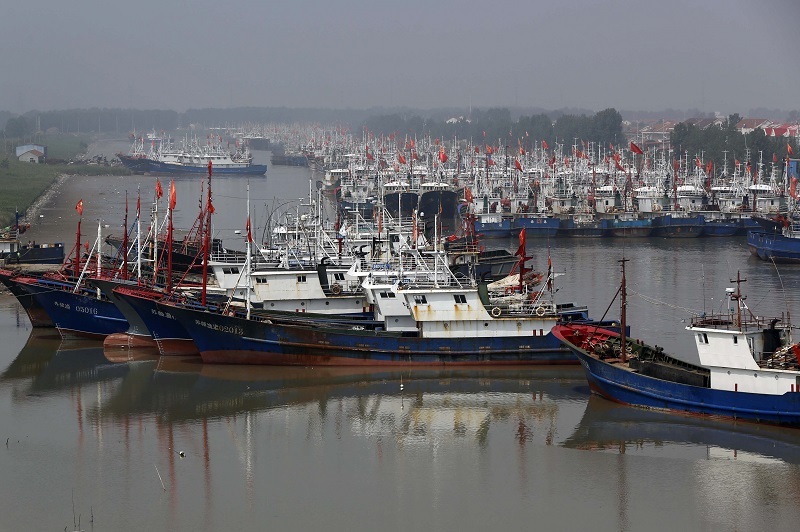 Fishing boats berthed on May 30, 2016, at a port in Lianyuangang, eastern China’s Jiangsu province, at the start of a three-month fishing moratorium. STR/AFP/Getty Images. No country—arguably not even China itself—wants to open up a “people’s war at sea” over access to regional fisheries. And though the U.S. Navy is already a regular visitor to Southeast Asian waters, the conduct of coast guard–like operations or direct involvement of the U.S. Coast Guard should not mean an open-ended contribution of U.S. assets to a mission that properly belongs to the region’s residents. That said, there is wide agreement among a growing number of partners that some demonstration of resolve in the South China Sea is necessary to ensure that the arbitral ruling does not become the “waste paper” that Beijing wishes it were. WCPFC boardings on the high seas, or an ASEAN framework adapted from this model, might be the appropriately scaled response to reinforce the fisheries-related elements of the arbitration decision, at least on the high seas. Done right, this approach might even inspire an inclusive regional dialogue about fisheries management zones and maritime law-enforcement coordination beyond the high seas among willing partners. This dialogue would ideally include China, but can and should go forward without Beijing if necessary. Participation would regain China some credibility among its neighbors as an actor committed to “regional harmony” and a “peaceful rise.” It would also contribute to China’s international reputation as an adherent to UNCLOS, the arbitral award, and regional fisheries management at a time when most Southeast Asian countries question the country’s commitment to regional development in line with the rule of law. Moreover, such participation would naturally flow from China’s existing commitments and practices under the WCPFC. In 2015–16, China conducted nearly 50 high-seas boardings on behalf of the RFMO in Pacific waters at a safe distance from its own nine-dashed-line claims. Chinese participation, however, is unlikely in the current climate and nonparticipation need not be a deterrent to other states moving forward. In fact, creating a framework for fisheries management absent China might be one way for Southeast Asian states to put reasonable conditions on China’s maritime engagement with them. This is a technique that ASEAN has used to good effect in both the trade and diplomatic realms: if external players want to engage ASEAN, they must adopt ASEAN-established rules, laws, and standards of conduct. Capable fisheries enforcement—legal, partnered, and effective—might be just the kind of demonstrated regional standard needed to ensure that the arbitral award and the rule of law more broadly will remain relevant to the South China Sea. Kerry Lynn Nankivell is a Professor at the Daniel K. Inouye Asia-Pacific Center for Security Studies (DKI APCSS) in Honolulu. The views expressed are those of the author alone and do not represent the official policy of the DKI APCSS, the U.S. Department of Defense, or the U.S. government. Banner image: © DONG-A ILBO/AFP/Getty Images. South Korean coastguard commandoes board Chinese fishing boats during a crackdown on November 16, 2011.